Glamorous, yet relatable. Sweet, yet spicy (Serrano, like the pepper). 245,000 Youtube followers, yet down-to-earth. 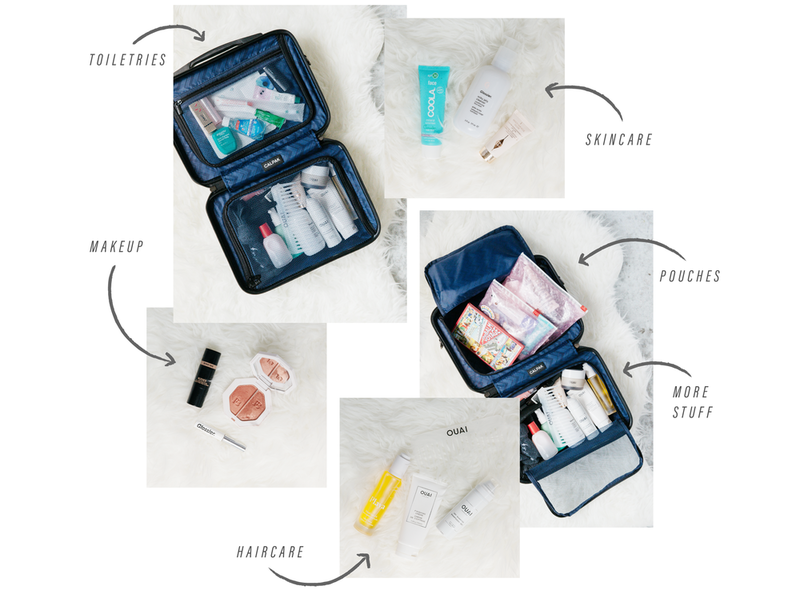 One of our favorite influencers, Amy Serrano, gives us a little insight into her life behind the camera, her favorite beauty products and how she uses her CALPAK Vanity Case — perfect for a traveling “product junkie”. What's in your Vanity Case? What's your biggest makeup splurge? My first big beauty purchase was the Chanel Bronzer. It was so pricey to me a few years ago but so worth it. I wasn’t really into cream at that time but every makeup artist was using it on set so I told myself I needed it. You’ll never finish that in your entire lifetime so it was a good splurge! What's your biggest skincare splurge? Drunk Elephant — I went HAM and purchased the entire set. I got the Vitamin C, the TLC, the Marula Oil, etc. So worth it. What's your favorite drugstore beauty product? L'Oréal mascaras are SO BOMB. First, I was really into Voluminous (that’s the OG for me). I’m now obsessed with Lash Paradise! What's your best beauty hack? I love a glossy highlight and I’ll use bombs like Balm Dotcom or even Vaseline. You just tap it right on the cheek bone and all the high points of your face and look so healthy, so radiant, glistening and glowy, in such a good way. This is a good selfie tip! What's your #1 beauty product you always remember to pack? Tinted lip balm. I play around with so many but right now, my current favorite is by Too Cool For School in Spilled Wine. It’s hydrating and gives you that “bitten lip” effect. I’m super into it. Note: I love a messy hair! I’ll usually rub the top of my hair and do a lip stain and smudge it out so it looks like you’re already kissing. I like to do a liner and smudge it out with my fingers. That way, you don’t really have to mess with perfection and you'll just be sending subtle hints. How did you get your start in the Youtube world? I loved binge-watching makeup tutorials on Youtube. The first person that I watched was Carli Bybel — I watched her all the time. Fast forward years later and I told myself I wanted to do it but for fashion but then it got really hard to shoot fashion looks by myself because it’s so much easier to crop your face and take selfies. So, I started doing makeup looks. I’m not “skilled”, I wasn’t trained — I was just playing around with products and people seemed to like it. They said that they loved the wearable looks that anyone could rock. Who is your all-time favorite beauty influencer? Hung Vanngo!!!! I LIVE FOR HIS LOOKS! I’ve already done so many of his looks on my Youtube channel. I’m inspired and straight up copying his looks 'cuz I love them so much. I think he does such a good job of being editorial but wearable and chic. How do you engage with your followers and how has their support inspired you? I live for those comments and DM’s from my followers because a lot of the time, they’ll share personal stories with me and I’m like wow, the fact that they’re sharing something so vulnerable with me means a lot to me. People have said, “I was feeling depressed and your videos helped me out” or “I love how bubbly you are!”. If I’m not in a good mood, I won’t film because I want to always give my best energy. I also LOVE their feedback and I always ask them questions. It’s so sweet, they’ve just gone on this journey with me because I feel like I’ve really gained their trust so that means the world to me. What advice would you give girls who want to start wearing makeup at a young age? I’m so against super young girls already wearing makeup because their skin is so beautiful at that age. Pick one feature you want to pop and keep the rest clean. Drugstore makeup is perfect for experimenting but I would hate for anyone to get used to themselves with so much makeup on. I feel like it messes up people’s confidence, especially when people apologize when they don’t have makeup on but I’m like, no, you look fresh! Makeup should be fun and expressive. What are some personal projects you're working on? I’m working on rebuilding my website because I want to do more styling, since I come from a celebrity styling background. I also want to be more creative with my videos and learn more about cinematography. I love editing so much! Also, I want to travel a lot more this year and infuse that into my videos to show what other countries define as beautiful and share beauty secrets that I learn along the way. I’m very excited for all of that!